The obstacle in front of most large, or mature companies of any size when it comes to digital and content marketing, is the battle with status quo. From strategy to tactics and especially measurement, change is often seen as interruptive and risky vs. adaptive. But without adaptation, we can hardly evolve, can we? 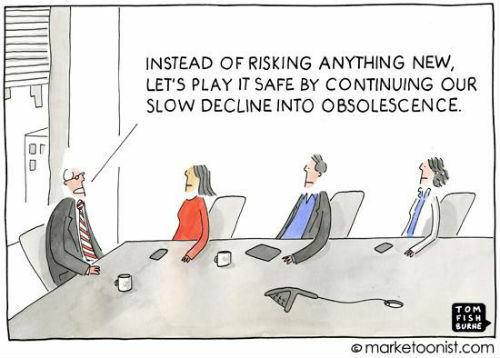 As Tom Fishburne implies in the cartoon above, change isn’t risky, safe is risky. 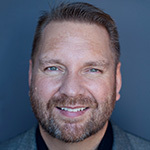 Companies evolving from Stasis to Production and into Utility and Storytelling modes of content marketing maturity begin to broaden the scope of what business goals content can deliver for a company. Because content touches all aspects of business communications, measurement amongst channels, between departments and across target audiences can get complex and even confusing. Part of my job is to simplify the explanation of the chaos that is digital and content marketing. For our readers that are in the midst of evolving their content marketing efforts from quantity to quality to creating better content experiences, here is an easy to understand model for keeping content marketing accountable and measurable. And heck, if Justin Cutroni, Analytics Evangelist at Google, likes it, it must be good right? These are great and certainly better than not knowing exactly what you’re trying to achieve with content marketing efforts beyond making more content to see what sticks. The thing about lists like those above is that they are not really organized according to the experience most companies are trying to create in combination with how buyers discover, consume and act on digital content. It’s not really a right or wrong thing, but I think organizing measurement closer to the activities that best represent buyer and brand interactions through content will help us better measure content performance. Such organization will also help keep content accountable and reveal performance indicators that allow us to optimize performance at any given time. That model I’m talking about is Attract, Engage Convert and it’s a way of seeing content marketing that I first introduced in the book Optimize back in 2012. It’s like a simplified sales cycle really, because there are three essential questions that need to be answered whenever content is created with marketing intentions. Organizing content marketing programs to be accountable through an Attract, Engage, Convert model answers these questions and empowers content marketers to be far more effective at achieving and communicating program results. 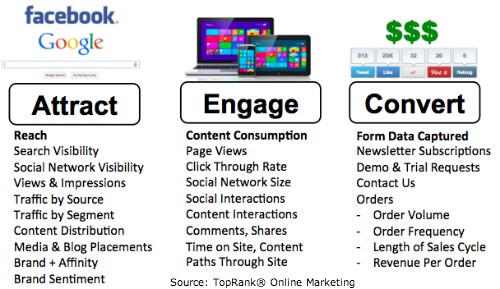 What do I mean by Attract, Engage and Convert measurement? 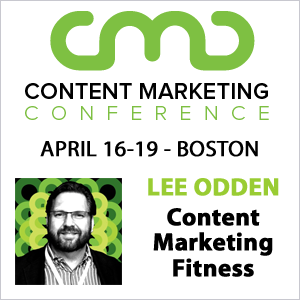 By organizing measurement of content marketing performance in this way, there’s a level of accountability and increased contribution that emerges – things that often get lost with content marketing operations with numerous moving parts, stakeholders and objectives. How are you organizing your content marketing performance? 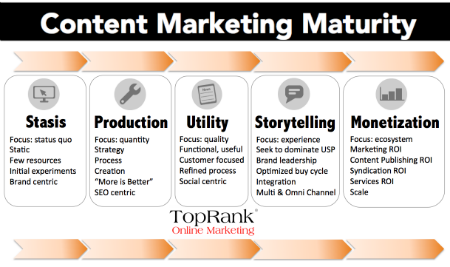 How far have you evolved through the content marketing maturity model? Excellent piece Lee. I like to think of the top of the funnel as creating awareness by delivering value and storytelling. Then, it’s about relationship building (my clients are small and medium businesses. I know this doesn’t always scale but it does for my target market). Then comes conversion, either what I call organic (It is easy to buy) or digital marketing (copywriting skills, CTA’s, guarantees, scarcity, etc.). Then you have customer and tribe relationship management (actually throughout the funnel), leading to word of mouth, repeat purchases, etc. Thank you Frank. You’re describing marketing across the entire customer lifecycle!